One of the cornerstones of life in the town centre is our town market. Walking through the market recently, you may have noticed the new gazebos that house the stalls. Proudly displayed on the awnings of the gazebos: ‘Established 1317’. The town was issued with its Market Charter back in 1317 by Edward ll. Its location has changed many times over the years, and it is currently to be found on Princes and Queen Street. The stalls line the accessway in front of the Town Hall and Barclays Bank; spreading around the Giles Statue and carrying down onto Queen Street. Here you can find the Food Quarter, which is building a reputation for attracting new traders offering a great selection of street food; a perfect lunch-stop with al fresco seating. A wide variety of produce can be found on the market including fresh flowers, fish, fruit and vegetables. Alongside this; local honey and eggs and a great cup of coffee from the Coffelink fire engine. Some of the traders have been with the market for many years. Markets offer a very experiential way of shopping, a real sense of community. With our ever-changing high streets and shopping patterns it is important that we do not overlook this aspect of town life, but instead embrace this as another way of shopping. 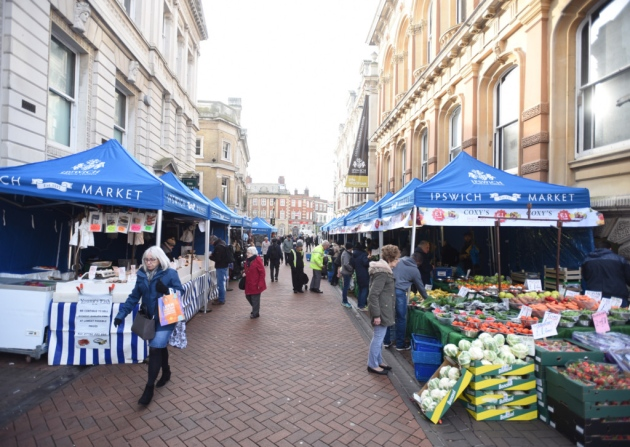 The Cornhill Regeneration project has obviously created some challenges to the market, but it seems to be adapting well to its current location. In the spring will be the launch of ‘LOVE YOUR MARKET’ campaign, to celebrate our market culture. Our market operates 4 days a week: Tuesday, Thursday, Friday and Saturday, from 10am- 4pm.